President-elect Donald Trump's daughter Ivanka and her hubby Jared Kushner are headed to Washington, D.C.! The fashion mogul and her businessman husband are decamping to the nation's capital in preparation for Kushner to take on the role of President Trump's senior advisor. Talk about insider! 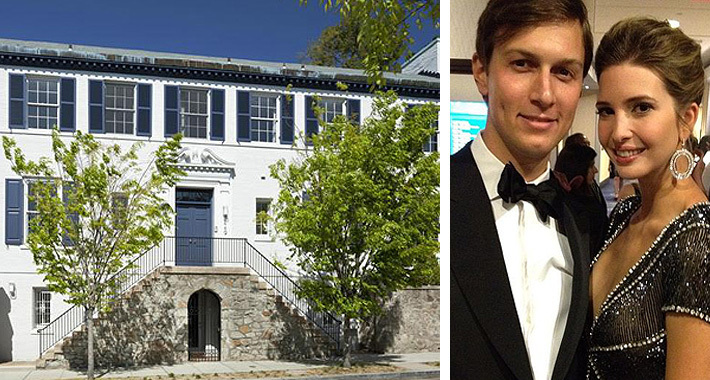 Coming from their posh pad in NYC, DC will offer a different atmosphere for the family of five ... a 1923 traditional brick colonial with a decidedly modern interior update will house the parents and three kids for at least the next four years -- if everything goes as planned. The six-bedroom, seven-bathroom home in the neighborhood of Kolorama was purchased in late December for $5,512,260 and is less than two blocks away from President Obamas future home as he transitions to civilian life. The 6870-square foot home has five fireplaces and original crown molding with an updated main kitchen and service kitchen for entertaining.